Do we need more ethnic politics, based on the proposition that, for example, only a ‘Hispanic’ person — whatever that is — can understand the concerns of other ‘Hispanics’? Do we need more emphasis on ethnic and gender studies in our schools? Especially when such courses are often presented from a separatist point of view, one which emphasizes the victimhood of a particular group and its need for reparations of various kinds? Do we need to encourage particular groups to see themselves as separate from other groups and in competition with them? Do we need to create even more hypersensitivity to the slightest instances of ethnic stereotyping? Do we need for these issues to be uppermost in our consciousnesses at all times? Do we need more restrictions on speech due to political correctness? Tribalism is a normal human characteristic, which evolved as a response to pressures created when disparate groups encountered each other. Like many aspects of human nature, tribalism can be constructive or it can be destructive. Tribalism is the root of patriotism and nationalism, which I see as generally good things (many will disagree, but that’s part of my point). But tribalism can also lead to conflict, and when multiple groups within a nation give their primary loyalty to their group rather than to the nation, such conflict is unavoidable. In much of the world this kind of conflict is the rule rather than the exception. Lebanon has been racked by ethnic and religious conflicts for generations; Iraq and Syria can only be held together by totalitarian regimes. The most stable countries in the world are ethnically homogeneous, and when this homogeneity is disturbed by an influx of immigrants the result is internal conflict, such as we are seeing now in Europe. Israel faces a tremendously difficult task of finding a modus vivendi among its Jewish and Arab citizens (one could consider the Haredim a separate culture as well). The US chose a different, but still practical, path. It was intended to be different from ethnically-based nations, following the now-unpopular path of the ‘melting pot’ in which a new, American, culture would be created from people of different cultures who, while retaining some distinctive characteristics, would primarily see themselves as ‘Americans’, loyal to the nation as a whole. Multiculturalism is closely associated with “identity politics,” “the politics of difference,” and “the politics of recognition,” all of which share a commitment to revaluing disrespected identities and changing dominant patterns of representation and communication that marginalize certain groups (Young 1990, Taylor 1992, Gutmann 2003). Multiculturalism is also a matter of economic interests and political power; it demands remedies to economic and political disadvantages that people suffer as a result of their minority status. Multiculturalists take for granted that it is “culture” and “cultural groups” that are to be recognized and accommodated. Yet multicultural claims include a wide range of claims involving religion, language, ethnicity, nationality, and race. Culture is a notoriously overbroad concept, and all of these categories have been subsumed by or equated with the concept of culture (Song 2008). Language and religion are at the heart of many claims for cultural accommodation by immigrants. The key claim made by minority nations is for self-government rights. Race has a more limited role in multicultural discourse. Antiracism and multiculturalism are distinct but related ideas: the former highlights “victimization and resistance” whereas the latter highlights “cultural life, cultural expression, achievements, and the like” (Blum 1992, 14). Claims for recognition in the context of multicultural education are demands not just for recognition of aspects of a group’s actual culture (e.g. African American art and literature) but also for the history of group subordination and its concomitant experience (Gooding-Williams 1998). Multiculturalism is associated with the academic Left and postcolonialism. An academic fashion, it is a dangerous one. Europe has taken this path, and we can see the results. Much of the criticism of Israel comes from the standpoint of multiculturalism. But Israel’s success is based on the primacy of one culture, the Jewish, Zionist one. It will continue to exist only if it can maintain this. There is no room there for multiculturalism. NPR, naturally, is squarely in the multiculturalist camp. And multiculturalism is non-trivially different from the melting pot: it rejects equality of opportunity and calls for special privileges for groups deemed historically disadvantaged; it emphasizes accommodation of linguistic differences rather than encouraging a common language; and it even permits some degree of legal or governmental autonomy for special groups. While there is no doubt that the melting pot had its downside, multiculturalism is a lot more than annoying political correctness. It has the potential to tear a society apart, as it is doing today in Europe. The melting pot, as long as there is also a commitment to equal justice and civil rights, can succeed here and should be given a chance. In April 2002, IDF forces fought with Palestinian guerrillas from the Fatah, Hamas and Islamic Jihad factions for 10 days. After the dust cleared, 23 Israelis were dead along with 52 Palestinians, of whom 5 were judged to be non-combatants. Immediately thereafter, Palestinian sources claimed that hundreds had died in a monstrous war crime that James Petras, an American academic, compared to the liquidation of the Warsaw Ghettto. Reports of the devastation multiplied, larded with atrocity stories. A ‘documentary film‘ made by a Palestinian director was full of such charges, including the supposed destruction of a hospital wing by tank shells. Later, it was pointed out that no such wing had ever existed. A residential area roughly 160,000 square yards about a third of a mile wide has been reduced to dust. Rubble has been shovelled by bulldozers into 30ft piles. The sweet and ghastly reek of rotting human bodies is everywhere, evidence that it is a human tomb. The people, who spent days hiding in basements crowded into single rooms as the rockets pounded in, say there are hundreds of corpses, entombed beneath the dust, under a field of debris, criss-crossed with tank and bulldozer treadmarks. In one nearby half-wrecked building, gutted by fire, lies the fly-blown corpse of a man covered by a tartan rug. In another we found the remains of 23-year-old Ashraf Abu Hejar beneath the ruins of a fire-blackened room that collapsed on him after being hit by a rocket. His head is shrunken and blackened. In a third, five long-dead men lay under blankets. A quiet, sad-looking young man called Kamal Anis led us across the wasteland, littered now with detritus of what were once households, foam rubber, torn clothes, shoes, tin cans, children’s toys. He suddenly stopped. This was a mass grave, he said, pointing. We stared at a mound of debris. Here, he said, he saw the Israeli soldiers pile 30 bodies beneath a half-wrecked house. When the pile was complete, they bulldozed the building, bringing its ruins down on the corpses. Then they flattened the area with a tank. We could not see the bodies. But we could smell them. In the first of this article published yesterday we described how even children were not immune from the Israeli onslaught. Faris Zeben, a 14-year-old boy, was shot dead by Israeli soldiers in cold blood. The soldiers in the tank gave no warning, said Faris’ eight-year-old brother Abdel Rahman. And after they shot Faris they did nothing. Fifteen-year-old Mohammed Hawashin was shot dead as he tried to walk through the camp. Aliya Zubeidi told us how she was on her way to the hospital to see the body of her son Ziad, a fighter from the Al-Aqsa brigades, who had been killed in the fighting. Mohammed accompanied her. “I heard shooting,” said Ms Zubeidi. “The boy was sitting in the door. I thought he was hiding from the bullets. Then he said, ‘Help.’ We couldn’t do anything for him. He had been shot in the face.” In a deserted road by the periphery of the refugee camp, we found the flattened remains of a wheelchair. It had been utterly crushed, ironed flat as if in a cartoon. In the middle of the debris lay a broken white flag. Durar Hassan told us how his friend, Kemal Zughayer, was shot dead as he tried to wheel himself up the road. The Israeli tanks must have driven over the body, because when Hassan found it, one leg and both arms were missing, and the face, he said, had been ripped in two. There’s more, but you get the idea. Reeves’ ‘reporting’ consisted of a combination of suggestions of terrible hidden crimes, uncritical repetition of Palestinian stories, and an overall tear-jerking emotional tone. He was careful, however, not to explicitly make any false statements that could be checked. So where is Phil Reeves now? Where does he fit, this vicious little whore, this character assassin of the Jewish state, this yellow journalist? Where else? Reeves — now called ‘Philip’ instead of ‘Phil’, befitting his new-found respectability as a ‘journalist’, found a spot at that paragon of fairness and professionalism, NPR! 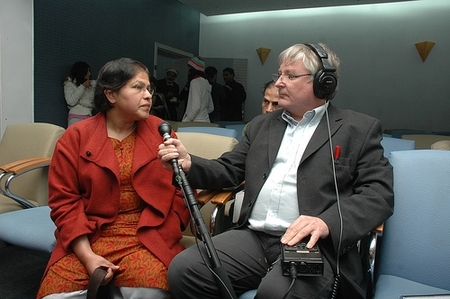 Reeves joined NPR in 2004, after spending 17 years as a correspondent for the British daily newspaper, The Independent. During the early stages of his career, he worked for BBC radio and television after training on the Bath Chronicle newspaper in western Britain. If you’re interested, you can find more about NPR here. 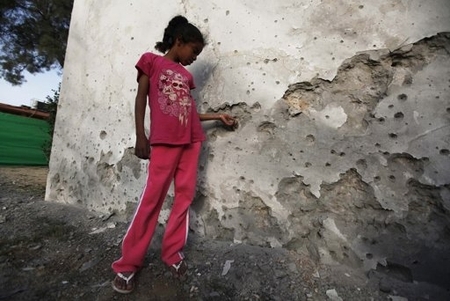 An Israeli girl in Beersheva examines ball bearings embedded in the wall of a school building damaged by a Grad missile fired from Gaza. The school was closed when the rocket landed, and no one was hurt. While southern Israel hunkers down under a massive barrage of deadly rockets — only effective warning and anti-missile systems have so far prevented any deaths — the usual suspects in the media are pumping out the usual message: Israel is the aggressor, killing Palestinian civilians. Israeli airstrikes killed two Palestinian militants and a schoolboy in the Gaza Strip on Monday and Palestinian rocket squads barraged southern Israel, in escalating fighting that has defied international truce efforts. Leaving aside the fact that the 15-year old ‘schoolboy’ was almost certainly not killed by an Israeli airstrike, but rather when an explosive device that he was carrying went off, the emphasis in the article and the headline is placed on Israel’s actions to suppress the attack in which about 240 rockets have been fired at Israel since Friday, and not the attack itself. [Steve Inskeep] …and we’re also reporting on violence on the border between Israel and the Gaza Strip: The shooting stretched through the weekend and into today. Israeli airstrikes killed two more people today in Gaza, that Palestinian-held area, bring the total to 20. Israelis have been bombing, Palestinian have been firing rockets into Israel, and NPR’s Lourdes Garcia Navarro has been following the story. Lourdes, what’s the latest? Note that they take the same approach as the AP, emphasizing defensive Israeli actions against combatant targets and de-emphasizing terrorist rocket attacks against Israeli civilians. ‘People’, not ‘militants’ or ‘fighters’ or (fat chance) ‘terrorists’ were killed. [Lourdes Garcia Navarro]: Well Steve, this morning we’ve seen more sorties by Israeli aircraft, and multiple strikes inside the Gaza Strip. Medical officials in Gaza confirm two men were killed so far today. The Israelis say they were targeting a team preparing rockets to fire into Israel. Overnight there were rockets successfully fired and landed inside Israel. In fact over fifty rockets were fired in total yesterday. For a second day today Israeli schools have been closed in the area around Gaza and people are staying close to shelters. Around one million people lie within reach of those Gaza rockets. The reporter begins again by emphasizing Israeli actions and Palestinian casualties. Palestinians ‘confirm’ that two ‘men’ were killed, while Israelis only ‘say’ they were attacking a terrorist rocket squad. Only after this does she mention the rocket attacks themselves. Inside Gaza, you can hear the sound of Israeli jets circling overhead. There are around 1.6 million Palestinians who live there in densely populated areas. We already know that two civilians were killed yesterday, a young boy and an old man. She continues, making sure we understand that Israel is deploying massive military force against helpless Palestinians. I rather doubt that ‘jets’ were ‘circling’; more likely helicopters and drones hit the rocket squads, but it sounds so much more frightening. We ‘already know’ — of course, we don’t, really — that two civilians were killed, and the suggestion is that this is just the beginning. [Inskeep]: There have been rocket firings, many, many of them over the years, along that border. What caused an escalation here? So we see that not only is this a story about Israeli violence against Palestinians, Israel started it. But the terrorist that was killed, PRC leader Zuhair Mussah Ahmad Qaisi, was responsible for an attack in southern Israel from the Sinai (not in the Sinai as the reporter incorrectly says) in August 2011 in which 8 Israelis were murdered, and it is quite credible that he was, as Israel says, about to launch another one (Qaisi was also responsible for the attack in which Gilad Shalit was captured in 2005, and also served as a conduit for money and weapons between Hizballah in Lebanon and terrorist groups in Gaza). [Inskeep]: OK, no fatalities in Israel, quite a few of them on the Gaza side, is anyone talking seriously about a cease-fire? Thus NPR manages to turn what should be a story about terrorism and defense against terrorism into one about the imbalance of power between Israel and the Palestinians, and how Israel initiated fighting which has killed Palestinian civilians (well, maybe one). There is no mention that the event that began it was a classic case of eliminating a ticking-bomb terrorist, or that despite the density of the population in Gaza, Israel is killing the fighters that are firing rockets without killing civilians. Only a few lines of the report allude to the massive disruption of the lives of Israelis, who have been running to shelters for four days (read the story of an Israeli schoolgirl here). And there is no comment about the fact that the objective of the Arab terrorists is to kill as many Israelis as possible. And here is something else you won’t hear about on NPR: despite the fighting, Israel is continuing to supply necessities to the Gaza population! Every day, truckloads of food, goods and cooking gas are supplied to Gaza through the border crossings. Yesterday more than 180 truckloads passed through the crossings. This morning, truck traffic was interrupted for a few minutes, when Palestinian terrorists attacked the trucks with mortars. Think about that.